Remember Buck Rogers or Flash Gordon? No? Of course not, you are probably too young; I will jog your memory: Buck Rogers (and others) was the campy sci-fi of yesteryear, the kind with an everyman protagonist and special effects which, let’s just say, “stood out” (re: sucked). This was the kind of science-fiction which acted as a precursor to Star Wars; of depicting space as the new Wild West daring humanity to tame it against the alien hordes. 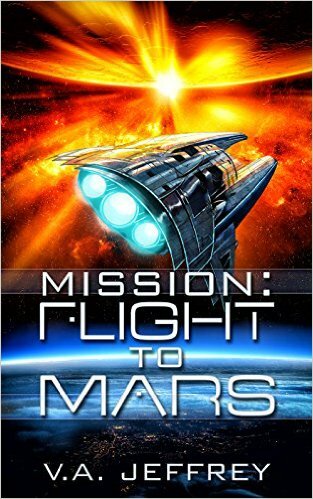 Mission: Flight to Mars author V.A Jeffrey takes such a canon as her inspiration. Unfortunately such grandeur seems to have missed its mark for Jeffrey’s first installment in her epic sci-fi series is sorely deprived of every cornerstone of enjoyable sci-fi: believable characters, a coherent and well-written plot, and interesting technologies… none is to be found here! But let me explain. The protagonist of the novel is a quality assurance agent working at an android construction assembly line. Bob Astor is his name and he’s sticking to it (unfortunately)… along with everything else, for you see, Bob is a severely lacking protagonist. He is a spinelessly confusing lead and is among the most naïve lead characters I have ever read (including those purposefully written as naïve by their authors), as he leaps into situations which he has no business being involved with, all for reasons left largely unexplained by the author. I associate Bob’s attitude to that of an absent-minded child wandering the aisles of a toy-store—he doesn’t know why or how he ended up looking at the baseball equipment but while he is there he minus well try out a few bats. Bob displays the exact same level of ignorant arrogance in his actions. The plot heaps onto this deeply underworked character (who, in all honesty, appears as lifelike as Mac’s speak and spell function) by running far ahead of the crawling pace which should be attempted. The plot begins with Bob being disciplined for supposedly stealing from the company he works for; however, at the last moment he is saved by a mysterious benefactor who not only saves his job but places him on a delegation to the grand opening of the moon city Langrenus. When there he encounters a desperate man at the end of his rope who prattles on about a vast conspiracy involving alien technology. Bob tries his best to help the man, but the man is murdered before anything is able to be done: before his death, though, the desperate man sends Bob a file detailing everything he knows. A key factoid is that Mars holds the key to everything. So what does our brave Bob do? Ignore the message and return to his daily life? Inform the police and let the authorities investigate? Hire a mercenary to track down the murderer and enact justice? Nope! The correct answer is: ignore his family, job, laws, and inability to defend himself— he rushes off in a spaceship not of his own, all the way to Mars, so as to investigate the strange ramblings of a depressed cowboy. Good thing he did too because as it turns out there is an alien city on Mars settled by colonist dissidents from an intergalactic superpower called ‘The Realm’ which is not only building up its forces AND technology but also intends to launch a surprise attack on Earth so as to enslave humanity. A huge swath of the writing at this point is terrible but before I sprinkle on more blame, I want to give credit when credit is due: Jeffrey, if it is to be said did anything correct in this messy manuscript (which to me painfully reads as a first draft), did succeed in making an intriguing Neo-Wild-West: the aliens on Mars are different, unique, and possessing enough “old school” and “new school” vibes to keep them at the center of the show. The customs, rituals, religions, lifestyles, evolutionary, social, and political values and structures which form the basis of the Martian society are—by far—the most interesting thing in the novel. This is no to say they are particularly informed by the author’s writing (because the explanations are sloppy) but that of everything written, the alien civilization is the most cogent literary facet expounded upon. Unfortunately, that is the only thing done even partially right: to list the deficiencies, (1) the dialogue between characters is nonsensical; whether it be between aliens and humans, or children and adults, everyone reads like the same monotone personality; (2) explanation of technology is brushed aside, leaving the reader confused as to the capabilities of the protagonist at any given time and why certain events transpire as they do; (3) Small segments of the book read as though they are missing: characters discuss something, then something happens, then something new—seemingly unrelated to the first happening—happens. Part of this issue lies in the author’s rushed writing; (4) Aid comes to the protagonist at an unbelievable pace. Every step of his journey, from the moment he lands on Mars to the second he departs, sees him aided by friendly natives whom just so happen to support Earthly autonomy. The accomplishments made by the protagonist are then, understandably, absurd parodies of actual plot developments, something which even when it is referred to by the characters themselves, does not manage to touch upon the profundity of the problem; (5) Poor writing, grammar, and punctuation. Characters fail as characters and very little makes sense. At the end of the day, the author needed to take far longer to write this installment. Although there is some socially progressive references, such as lamentations on the demise of labor unions and the right of entities both national and biological to self-determination, something which shows a level of class consciousness on the part of the author, thereby elevating—just a tad—the text itself (when we consider it in relation to the inspirational sources), I still cannot overlook the glaring issues associated with the bulk of this book. Jeffrey is writing a series and with the next three installments already out, it is clear that though she enjoys penning tales of adventure, she needs to take a breath, step back and spend more time brainstorming, editing, and revising. This project has potential but only if she spends more effort writing and less effort at churning out the literary equivalent of vitamin pills. As it presently stands. I cannot recommend this text to anyone; but hey, it is free on the Amazon Kindle store, so if you are either intensely bored and forgot that you can go to a library, or want to judge for yourself, the price for admission—ignoring the time investment—is positively low.